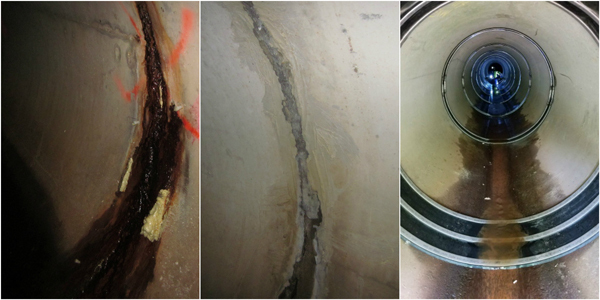 In spring 2017, the Michigan Department of Transportation (MDOT) discovered a serious problem: Joint leaks in its 72-in. storm culvert under I-90 at New Buffalo threatened the safety of interstate travel through a busy tourism corridor. MDOT engineers were concerned that the highway could collapse if water continued to infiltrate the culvert. They tried to remediate this sinkhole-in-the-making by injecting chemical grout into the pipe joints, but water still got in. The I-90 New Buffalo culvert was an urgent, high-priority project; it demanded an efficient, yet economical solution. HydraTech Engineered Products’ staff engineers suggested the HydraTite internal joint seal—an affordable, quick-install rubber seal often used for emergency pipe repairs. The HydraTite seal offers flexible, mechanical, trenchless point remediation for leaking pipe joints. The system consists of a rubber seal held in place by stainless steel retaining bands. A ribbed design ensures an airtight seal and allows for multiple seals to be interlocked on long lengths of pipe. The retaining bands are positioned in the seal and press against the pipe wall with a “wedge-lock” mechanism that enables great flexibility with the lowest possible profile. Each seal is custom-manufactured in one piece. Test valves allow the system to be tested for leaks after installation, before the pipe is returned to service. After this solution was approved, HydraTech got to work, first cleaning the pipe’s interior and removing the grout ports, then methodically sealing 114 pipe joints from inside the culvert. Seals of several different widths were used to accommodate the condition at each of the joints needing repair; each seal was 72 in. long. The crew and all materials entered through the culvert’s open ends, allowing the work to be done without disruption to the summer-peak traffic above. Installation took approximately three weeks. HydraTite sealed the joints and removed the sinkhole threat for a fraction of the cost and inconvenience of the alternative solution: full replacement of the culvert. Water infiltration into the culvert has stopped, and MDOT’s concerns about the safety of I-90 travelers at New Buffalo are gone. HydraTech engineers, manufactures and installs custom solutions for infrastructure protection, maintenance and repair. The company strives to deliver smart infrastructure solutions through intelligent engineering; long-lasting, economical, non-disruptive remediation; and comprehensive customer support. The preservation of existing infrastructure through HydraTech’s restoration techniques offers economic and environmental benefits by improving long-term safety and efficiency. There is no such thing as a one-size-fits-all HydraTech product. HydraTech develops families of products, designed and tested for certain applications, from which their licensed, professional engineers customize solutions. Before offering a recommendation, HydraTech staff engineers assess the problem—in person when appropriate—and provide a written report with photographs, detailing potential solutions. HydraTite has been used in more than 30,000 installations—some going back more than 20 years—and has a 50-year design life. It is NSF/ANSI 61-approved and recognized by AWWA M28.